MySQL Enterprise Backup (MEB) is a MySQL Enterprise feature that is separate from MySQL Workbench. For more information about its functionality, see the MySQL Enterprise Backup documentation. MySQL Workbench provides an interface to MySQL Enterprise Backup, as described in this section. A recent version of MySQL Enterprise Backup. The MySQL Enterprise Backup support policy is to support the current GA version of MySQL Enterprise Backup, and the major version before that. This dictates the minimum MySQL Enterprise Backup version required by MySQL Workbench, which is the major version before the current GA release. Setting an encryption password is required to perform backup and restore operations on encrypted tables (see Options Tab). Managing both local and remote MySQL instances is available on Linux and macOS, and managing local MySQL instances is available on Microsoft Windows. Remote management is configured using SSH Remote Management. A MySQL connection with a root user. The MySQL server configuration file path must be set and correct for the MySQL connection. The user running MySQL Workbench must be a sudo user (Linux and macOS) that is able to execute the MySQL Enterprise Backup binary. For MySQL 8.0, use the MySQL Enterprise Backup version with the same version number as the server. 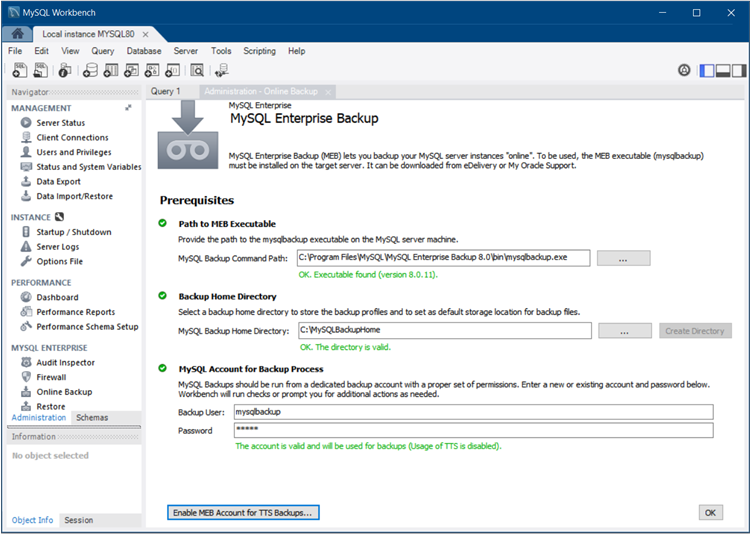 For MySQL 5.7, use MySQL Enterprise Backup 4.1. For MySQL 5.6, use MySQL Enterprise Backup 3.12. The path to the Backup Home Directory, where backup profiles and data is stored. This can be created from within Workbench from Settings. Create MEB Account: Available if a backup user does not already exist. Change Password: Available if a backup user does exist. Fix Grants for MEB: Available if the user's privileges are invalid, which alters the user account by adding the RELOAD, SUPER, and REPLICATION CLIENT ON *. * privileges. The following figure shows an example of the prerequisites. If any of the requirements are not met, then an error will be generated when attempting to use MySQL Enterprise Backup features. Uninstalling Workbench does not remove the associated MySQL Enterprise Backup backup tasks. To stop the scheduled backups, edit the related "Task Scheduler" entries on Windows, or remove the associated cron jobs on Linux and macOS. Uninstalling Workbench does not remove the MySQL Enterprise Backup master related configuration file, the configuration files generated for each defined profile, or the MySQL backups.